The first week consisted of the usual activities we do when getting to a new city. This typically consists of exploring, eating, getting unpacked, and working, Medellín was no exception. Our welcome event was at a local restaurant/bar. We were entertained by a traditional Colombian quartet. After the event, a group of our Remotes hosted a roast of two Remotes who were leaving our group, the results were several funny jokes and a lot of laughs, it was a great event. The first week we had a Tienda Crawl, which consisted of visiting two different Tiendas, where locals hang out and drink and eat. We got a feel for what a local typically does on a weekend night. The end of the Tienda crawl took us to a beer festival where we found a great band and finished the night with some live music. The first week also consisted of venturing to a different part of the city, where it is less touristy. A travel mate of mine and I headed south of Medellín via metro and grabbed a nice local meal and walked around to try and get the local feel. The first week went by fast and was over before I knew it. I love the water and the beach. Being in Medellín, we were a 45-minute flight from the coast of Colombia. If I am going to work from anywhere, why not work from a beach. I met my girlfriend there and we got ourselves a nice AirBnB by the water. Cartagena is a great city, there is a great historic wall in the city center, and is full of history. We walked around the city, the night life is vibrant, the streets are full of dancers, vendors and musicians. The food is amazing, and the sunsets are beautiful. The beaches are ok, they were not my favorite, but still being near the water was a great feeling. We found ourselves eating fresh seafood each night, including a spot that the infamous Anthony Bourdainand featured on his show. To change things up a little, we decided when we were there, to check out a beach house that a few people in our group had been to. The name of the place was Blue Apple Beach house. The Beach House is a 30-minute boat ride from Cartagena and is small boutique hotel with only 6 rooms, a pool that faces the ocean, and a full restaurant and bar. We arrived in the afternoon and worked while we ate a lunch. Once done with work, we relaxed by the pool, swam, and took in the easy-going atmosphere. When it was time for sunset, we walked down to the beach and enjoyed the sun setting on the Caribbean Sea. The room we stayed in had a patio with a hammock, a nice large bed, and the bathroom/shower was located outside. At night, we walked the short distance to the restaurant and had a great dinner accompanied by a beautiful ocean breeze. It was peaceful, and the sounds of the ocean sang us to sleep. The next day, we hung out at the beach house, and relaxed by the pool, until it was time to catch our boat back to Cartagena. We arrived back to Cartagena in time to for sunset, and spent our Saturday night watching the sunset, eating a nice dinner, and taking in the hustle and bustle of Cartagena one last time. The next day we checked out, and flew the short flight back to Medellín. One of the cool things about Remote Year is that we have Track Events. Prior to getting to a city, you pick a track, which consists of different activities focusing on a theme. This gives us an opportunity to learn about local culture in a variety of ways. One of my favorite track events in Medellín was one about the fruits of Colombia. When we were in Bogotá I was mesmerized when walking through the market at all the fruits I didn’t recognize. This event gave me a chance to see and try all those fruits I had seen prior. Some of them were good, some not so good. It was great to try these and have a better understanding of the fruits of Colombia. I will miss not being able to get some of these when I am back in the United States. What do you do on a Saturday in Colombia? You get a finca, and have a party. What is a finca you ask? Finca translates to estate from Spanish to English. It is a piece of land in a rural area that consists of a building that is near a plantation or woodland. Our group knows how to throw a party, and this was no exception. Our group got together, and showcased all the talented people traveling with us. The finca had a pool, and a large grass area. We had live music, stand-up comedy, and DJ music. A group of guys in our group put together a band and rocked the house. They called themselves the Con Mucho Gustos, and my buddy Sean got his hands on an electric guitar and rocked out. The other guys killed it as well. If they ever make it big, I hope they will consider me to be their go to Photojournalist. our resident DJ did what he does best and played some dance hits. We also saw the debut DJ Tube Top which was two girls in our group Dj'ing from a playlist. They crushed it as well. As far as I know the finca was still there when we left, so that is good. It was a blast and a great all day fest with our group and then some. The Sunday after Finca Fest, I got a message on my phone that someone in a group that was going Paragliding had backed out and a spot was open. I was bummed when I didn’t get in the group earlier in the week, so I was happy to see this message pop up. I had never gone paragliding and was happy to be able to have the chance to do it. We met up and headed to the mountains about 45 minutes outside of Medellín. We hiked up a hill and got to an area where there was a huge grass area where you could see people running and taking off into the sky and floating via parachute over Medellín. We waited a little bit and then the time came for my turn. I walked up to the hill, got strapped on to another guy, and the next thing I know we are running towards the edge of the hill. We kept running until suddenly I was running through air, my feet weren’t touching the ground, and we were off. My stomach sank a little and I was filled with the sensation as if I was floating. The glide lasted 20 minutes and we floated above the mountains and you could look down and see Medellín below. It was amazing. I had gone skydiving before, and paragliding feels a lot like the parachuting aspect of skydiving. All you hear is the sound of the wind, and it is extremely peaceful. We made our way back to landing zone, and had a gentle touch down. It was such a great experience and I felt so lucky to have been able to do it. Myself and two other remotes embarked on a road trip south of Medellín. We rented a car. Renting a car in Colombia is quite the experience. There is a ton of forms to fill out, and I thought they were going to ask for a blood and urine sample, but luckily, they didn’t. Luckily my travelmates handled all of that, I just volunteered to do the easy part, the driving. Once we got the car, we were on our way and I found myself behind the wheel on the crazy streets of Medellín. As the journey started, the car seemed to not have much power, even by pushing the pedal all the way to the floor. It was a tiny car, and I assumed that was the reason. At one point, I look to the emergency break section of the car, and ask my fellow passengers if the emergency break was engaged. As it turns out, it was pulled half way, we took it off and were on our way, with a little bit more power to our tiny little car. Our first stop was the city of Jardin. Jardin is a small city, surrounded by mountains, and like most time South American cities has a town square located in the center. We stayed at a cool chalet on the edge of town. We walked around the town, took a cable car up to one of the mountains, hiked down the mountain, and then sat in the square and watched the town come to life as the sun started to set. As we were sitting in the square, we were near a church. Inside the church, a funeral was taking place. The church was filled with people honoring the life of the person inside. Outside the church a group of children were playing soccer. I could not help but notice the symbolism in front of me. It was an alpha/omega type moment of life. The children representing the beginning and the funeral representing the end. After sitting in the square, we enjoyed a nice dinner while a rain storm moved in, we then walked back to our chalet. 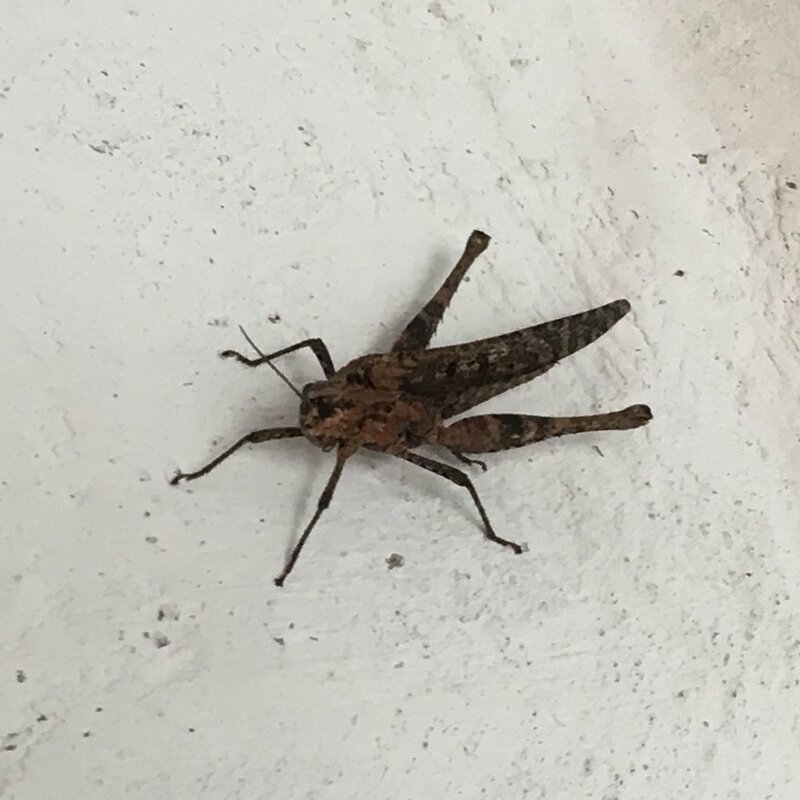 My bedroom had a large door that opened to the greenery outside, and I opened the doors falling asleep with a cool breeze, and being serenaded by crickets. The next morning, we woke up, grabbed some breakfast and were on our way to our next stop. Our next stop was the city of Salento which was going to be a 5-hour drive from Jardin. We got on the road, and made our way through the twists and turns we encountered on the highways of Colombia. On the way to Salento, we were driving through the countryside and came across a peacock sitting in a tree over the center of the road. Our drive took us through the city of Pereira around rush hour, and as the driver I got a taste of driving in South America, in a big city during traffic. Once through Pereira we made it to Salento, and made it to our AirBnB which was located on the outskirts of Salento. The path to our place was a rocky road. We found the place and pulled in to find the great house that we would be staying at for the next two days. The house was located on the top of a hill, and was owned by a French gentleman who retired to the Colombian countryside. It was a beautiful spot, surrounded by animals, and we had a great view of Salento. We worked from the outside patio and watched the sunset. Our first night we headed into town and found a restaurant to grab a bite. The food was good, but we were entertained by a girl singing and a guy playing the guitar. The girls voice was spectacular. She was singing all the hits, and it was nice to sit and enjoy live music. The night ended, and we headed back to our place. The next day, we woke up and our host had a nice breakfast prepared for us while we sat on the patio, did some work, enjoyed breakfast and listened to the rain. Our plan for the day was to do a hike, and once the rain stopped we headed towards the Palm Tree Valley. The hike deserves its own section, so see below for more on that. We woke up the next day, enjoyed some breakfast, worked a little, and then headed to a coffee plantation tour before we headed out of Salento. The coffee plantation tour was a bust, and the guide talked too much, and we learned a little bit, and we had to cut it short and make our way back to Medellín. There is a lot of things to do in Salento, and I could see myself going back there again someday. On our 2nd day in Salento, we made our way to Valle De Cocora which translates to Palm Tree Valley. This is a valley that is home to a large amount of Quindío Wax Palm Trees. It is a mountainous range, and there are a couple hikes to explore the valley. There are two options when hiking the valley. There is a 2-hour hike and a 5-hour hike. We got there later in the day due to the rain and didn’t think we would be able to get the 5-hour hike in. We started the 2-hour hike, and ended up just going and going and kind of by accident ended up on the 5 hour hike. It was a gorgeous hike, filled with water, beautiful palms, and a hummingbird sanctuary. It was a challenging hike and at the end, we were tired, but glad we could do the long hike as we got to see a lot more than we would have on the 2-hour hike. It is a beautiful area and I highly recommend it. There is a great walking tour in Medellín. The tour is 4 hours in length and takes you through the parts of the city that you don’t normally see. It was a great way to hear about the history of Medellín and how the city has transformed so much from all the things that have gone on there. The city is an interesting place, and living in the touristy part of it, we didn’t get to see it all and this tour allowed that to happen. Walking tours have been a great way to see cities and get information that you don’t usually hear in all the cities I have been to and I highly recommend them if you visit a new city. About an hour and a half outside of Medellín is a city called Guatapé. Guatapé is home to El Peñon de Guatapé. This a cool attraction to do when in Medellín and to do this we went with a company called Van Por Colombia https://vanporcolombia.jimdo.com This company picks you up in an old-school van, and takes you on a journey to Guatapé. The first stop is to the owner’s farm house in the countryside where you enjoy a nice breakfast and jump on his trampoline. He then takes the crew back towards Guatapé. The group we had was made up of two vans and a group of people loaded up on the roof of the front van for the ride through the countryside until we got to the main road. Once we got to the main road, we drove for a little bit until we came to a bridge. The van pulled off to the side and proceeded to let us know we could jump off the bridge and swim for a while. We did that and it was awesome. I jumped off cliffs in Croatia and this was similar, but still a scary/exciting feeling. After we hung out there for a little bit, we loaded back up in the van and headed toward the rock in Guatapé. Once we got to rock, it was time to get out and conquer the 750ish steps to the top. The rock is 1,263 feet tall, and once at the top, you get some amazing views of the lakes that surround the area. It is beautiful at the top and was cool to see the view from there. While we were making our way to the top of the rock, our host was busy making us a nice meal out of the back of the van. The food was amazing and we sat in the grass and ate the delicious food that was prepared for us. The next stop was the city of Guatapé. Of course, there was a town square with a church and the buildings were bold and bright colors. A lot of the buildings were decorated on the outside with different symbols said to represent something important to the person who occupied the building. After hanging out in the city for an hour or so we made our way back to the Van and started back towards Medellín. On the way back we stopped at a lookout point over the city and saw Medellín from above and it was beautiful. We were then dropped off and our day was done. It was an awesome adventure and if you are going to make your way to Guatapé, I suggest doing it in a van. The last week in Medellín was filled with a lot of work, as I put a final push on getting my company's website updated. A few of us have a supper club and we meet up for dinner in each city and we did this during our last week. We checked out a great restaurant called Carmen. We had our farewell event at a restaurant called La Mayoria which served us traditional Colombian food, and at the end of dinner had a horse show in which the horses dance in the restaurant. It was unlike anything I have seen in my life. The next day we had to leave Medellín. On the way to the airport we stopped at a horse farm and got to do some horseback riding before we took off and head to city # 10 Lima, Peru. 9 months down, three more to go, thank you for reading! On December 31st, 2016, my alarm went off at 3AM to get me up for our 7AM flight from Mexico City to Bogota. I was sad to leave Mexico City as I loved it very much, but was happy to be starting the South American leg of our journey. The travel from CDMX to Colombia was seamless, and we arrived in Bogota the afternoon of 12/31. This would mark our first day in Bogota, our first day in South America and the last day of 2016. Being New Year's Eve, I couldn’t help but reflect on the year. 2016 was a great year with a lot of ups and downs, but all and all was a great year and I was still in awe that I would be ringing in the New Year in Bogota, Colombia. Below you will find my favorite things about my time in Bogota. One of the advantages to being on Remote Year is that the amazing people that work for Remote Year do a helluva job planning events. This was the case for NYE. We knew for a while what our plans were going to be for NYE, which was great. After getting in to Bogota on New Year’s Eve, the last thing you want to worry about is planning something for New Year’s. An event had been planned for us at a place called Andres Carne de Res. This was a gigantic restaurant with live dancing, great food, and it was full of people ringing in the new year. It was about 35-45 minutes away from where we were staying in Bogota. We all met at a park, hopped on some buses and set out for the night. Upon arriving, the place immediately had an energy to it. The décor, the atmosphere, the food, and the music were just pulsing. We got a bunch of different tables, sat down, and were served a variety of Colombian food. There was live dancing, and it seemed like a place that a lot of locals were at. The night was fun, and our group of Remotes rang in 2017 with each other and a bunch of Colombians. The New Year’s festivities came and went and after catching up on some sleep, I woke up the next day for my first full day in Bogota. When you are on Remote Year, that first full day is always a lot of fun. When you arrive from travel day, you are always tired, sometimes it is night, and you don’t get the whole feel of the area you are staying. The first full day is made for exploring. I stepped outside my apartment and started my wandering. We had met at a park by my apartment to depart for New Year’s and that was my first stop as it looked awesome, but I couldn’t really see it at night. The park was everything I could have imagined and more. It was enormous, and full of life. It had walking paths, running paths, workout areas, tall trees, beautiful green grass, and seemed to be the epicenter for locals to enjoy their free time. I walked through the park for a long time, soaking in the new city and checking out all that it has to offer. This park would become a place I would frequent during my time in Bogota. Monserrate is a lookout point at the top of Bogota. You take a cable car to the top and get to view the whole entire city. It is beautiful, and the views from up there are spectacular. There are several things to see at the top, a church, several restaurants, and a little market to walk through. There is nothing like being on top of a mountain to look down on a city and see how truly big it is. There is a ton of street art in Bogota. I wouldn’t say there is as much as Valencia, but it is close. Bogota offers a Street Graffiti tour that goes through the history and showcases the various art that is painted on the city walls. The tour starts in the downtown area and walks through several neighborhoods. There is some amazing work out there, and it was great to hear the stories behind the art and the various messages contained in the art. I know I have probably seen Botero’s work at some point in my life, but it wasn’t until I got to Colombia that I feel in love with his unique style. Botero’s style is somewhat simple, but the look is unique. His style is to take his subject and paint them in a round kind of way. Examples are in the pictures below. He is a Colombian artist and the museum is located in downtown Bogota. It is definitely worth the free admission to the museum to check it out. There is also a gift shop in there if you feel inclined to get a tshirt, like I did. Hiking trails in Colombia are unique. The SenderoQuebrada La trail is one that we did one weekday morning. The reason they are unique is that they are only open in the morning, and you must be down by 9AM. I was told the reasoning for this was due to the amount of robberies they had on the trails. Thieves would wait in the bushes and rob people as they hiked up. They now have police throughout the trail to prevent that from happening, but couldn’t have police there all day, so they stop it at a certain time. It was a fun hike, you go through jungle like terrain, also pine trees, and then have a nice view of Bogota. The view is better on a clear day, it was a tad cloudy when we went. Thank you to Bogota’s finest for keeping us safe. Tu Sirves is an organization in Bogota that organizes various volunteer activities. Remote Year partnered with them to organize a trip to a local prison in which we would visit with prisoners and talk with them. This was such an eye-opening experience. We met at the bus station in the morning and took the bus to the stop closest to the jail. The jail was about an hour bus ride out of town. We got off the bus and we weren't in our normal part of town that we were used to. We were told to make sure not to have anything in our hands, as it would most likely get stolen. Once we arrived at the jail, we had to go through several security measures before we could get in. This involved being searched, having our fingerprints taken, and making sure that all our belongings we brought were left behind. We were accompanied by a staff member at the jail. I have been in prisons before, but I had never been this close to inmates. We walked through, and surprisingly people were friendly and a lot of people said hello. We were then given a tour of the various workshops they have for the inmates to work on stuff. The first stop was the woodworking shop. Several inmates were in there and working on various projects. There were some cool things, and the inmates were proud to be able to show off their work to us. One of the inmates even gave one of us a gift, a wooden car he had made and painted. It was truly amazing to see, and really got my head turning about how the prison system could be different to help inmates become better, and not just be locked away. The next area we visited was the painting area. This was not as busy as the woodshop area, but there were some cool things happening there, and was also where some of the items made in the wood shop were being painted. One of the inmates showed us how he painted flowers, and explained that he just taught himself, by looking at, and reading art books. One interesting tidbit was that the inmates had to get their art supplies from their family. The family would drop the stuff off, and then the inmate would have to buy the stuff for a minimal fee. The inmates were able to sell their art and therefore had a way to make money. It was an interesting approach to say the least. After the painting workshop, we went to the leather/sewing workshop where several inmates were making wallets, purses, and sewing clothes. Once again, it was great to see inmates being able to build and develop skills that could help them in the future if they were to get out of prison. After the tour of the workshops, we made our way to the courtyard where we would meet inmates and spend about 45 minutes talking to them. We were given training before our visit, and went over the exercise that we would be doing with the inmates. The section we were in was the drug section. This was where inmates who were caught with various drug violations were held. There were a variety of ages, races, and nationalities amongst us. We started our time by doing a dance, to break the ice and get everyone comfortable. It was a lot of fun, and helped the inmates become more comfortable. We then broke off into groups, and spent our time talking with each other. It was an amazing experience to be able to understand where they were coming from. The exercise we did was to list people we have hurt, and people who have hurt us. It is an interesting exercise and was good to hear the inmates open up on how the actions that landed them in prison affected others. There was a language barrier at times, but I was still able to pick up on things. The visit ended, we went back to our lives, and they back to theirs. I wasn’t sure what to expect from the visit, but it opened my eyes and my heart to another world that I would have never sought out in my past life. 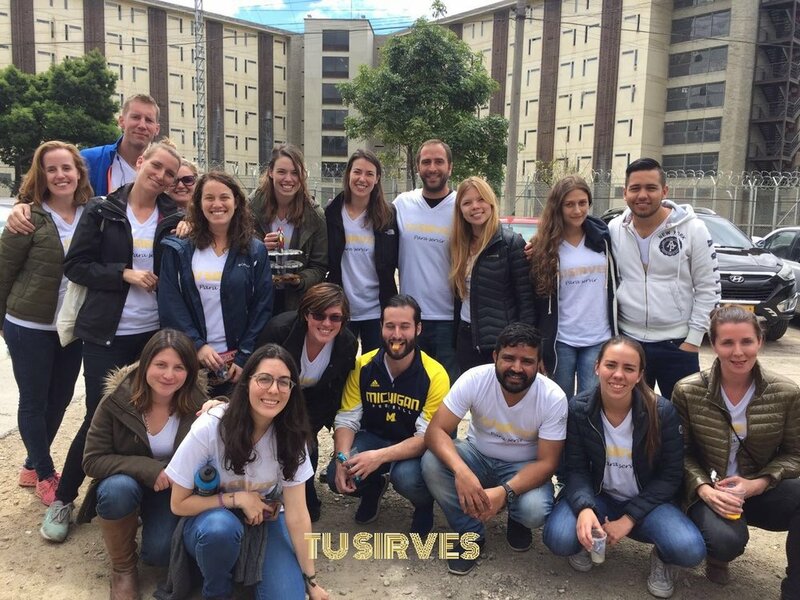 If you are ever in Bogota and are looking for volunteer opportunities, consider Tu Sirves, they are a great group of folks, who love what they do and helping others. Colombia is known for its coffee, this is no surprise. Being in Colombia allows for you to really understand the process of how coffee is made. I did this by taking part in a coffee tasting. The tasting was hosted by one of only 25 coffee sippers in Colombia. To get to this level, you have to understand coffee and pass a series of tests that take place over the course of a week. Our host had done that and so we were in good hands when it came to learning about coffee. We were taught about the whole entire process, how the plants grow, and how it ends up in your coffee cup in the morning. It is something that I never knew much about, and to hear about how it is all done is truly fascinating to me. We learned the process, then started the tasting aspect. We tried three different types of coffee, while our host gave us all the things to look, taste, and smell for. After that, we then talked about and tried the different ways that coffee can be made. We made coffee in a French Press, an arrow press, a Chemex, and a regular coffee maker. It was amazing to taste the differences. The experience ended with me leaving with a much higher appreciation for the drink that I have most every morning. One Saturday, we got on a bus and drove about 2 hours outside of Bogotá to a town called Suesca. This is a tiny town and is home to a bunch of farms, and is surrounded by beautiful trees and hills. We met our guides upon arrival, and they proceeded to take us on walk. We would walk through all sorts of terrain, cross a bridge over a river, and eventually ended up at some caves. Once at the caves, we put on helmets and headlights and started making our way in. It was incredible and challenging. We crawled in and out of caves that in the past were used as prisons. It was hard, claustrophobic, and painful, but ended up being one of my favorite day trips of Remote Year. I made a video to highlight it, you can see what it was like by watching. One Saturday a fellow Remote and I set out on a mission. The mission was to make a video for a Vimeo weekend challenge. We brainstormed ideas and came up with a few different ones. After a little more deliberating, we finalized our plan and made a short film. We didn't win the challenge, but we had a great time making it. Below is the final result of a little Saturday afternoon movie making. Colombian food is interesting. It is a lot of meat, plantains, veggies, and a corn thing called an Arepa. I enjoyed it, but it wasn’t my favorite food country. Bogota has a great food scene and I did my best to discover as much as I could. There are some great restaurants and places to eat in Bogota, and I definitely did my best to check as many places out as possible. All and all I enjoyed my time in Bogota. It was a challenging month for several different reasons which allowed me to reflect on a lot of things. Another exciting that happened this month was the birth of my nephew Finn. Finn is my first nephew. I have three nieces, so it is nice to have a boy in the mix now. It was hard to be away for this moment. My little brother and I are close and I would have loved to be there for him as he became a father for the first time, but I count the days until I get to meet and hold Finn in person. As for me, I am doing well. The dominant question as time keeps ticking away on Remote Year is “What are you doing after RY?” I don’t have an answer right now. I have a few ideas in mind that will hopefully lead to more clarity soon. Until then, I have so much to accomplish and will keep doing so. Thank you for reading. The next update will be about Medellin, which has a nickname of the “City of Eternal Spring” stay tuned, adios!